Oil shale activity is rebounding after being relatively dormant for years. 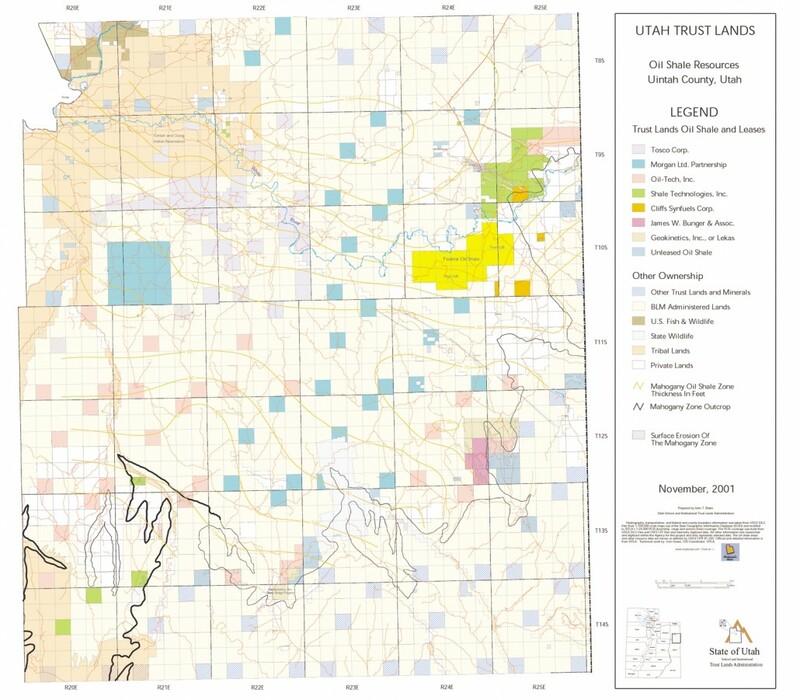 During 2001 the Utah School and Institutional Trust Lands Administration (SITLA) received oil shale lease applications on approximately 46,271 acres of trust land in Uintah County, Utah. These new leases, when added to the 40,483 acres of trust land already under lease for oil shale at the end of 2000, increased oil shale lease acreage 114 percent. 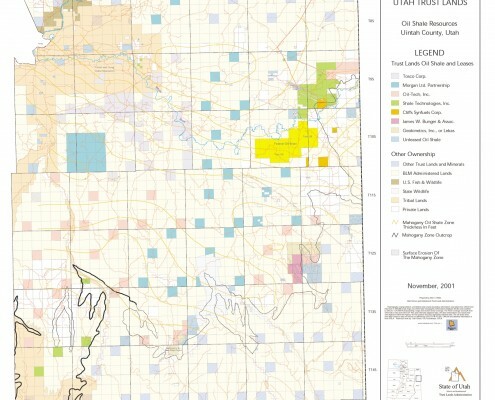 Over 95 percent of all trust land acreage considered valuable for oil shale in Uintah County is now under lease. Morgan Ltd. Partnership and Oil Tech, Inc. leased the additional acreage. They join long-standing lessors including: Tosco Corp.; Shale Technologies, Inc.; Geokinetics, Inc.; Mitchell Lekas; James Lekas; James W. Bunger & Associates, Inc.; and Cliffs Synfuels Corp. SITLA recently created a map, Utah Trust Land, Oil Shale Resources, Uintah County (reduced version is shown here), to show the distribution of these leases. A copy of the map may be obtained via the Internet at http:/wwwtl.state.ut.us by clicking on the Trust Lands maps button. Utah trust lands, in scattered school sections and in strategically located land blocks, contain more than 10.3 billion barrels of shale oil. The vast oil shale resource contained in the Uinta Basin continues to attract companies’ research and development interest as a raw material from which petroleum products can be produced. Potential exists for production of large quantities of shale oil (kerogen) through underground mining and thermal extraction (retorting) at a surface facility or through in-place retorting of the kerogen. The kerogen could be used as a feedstock at an oil refinery to produce gasoline, diesel fuel, and jet fuel. SITLA receives much of the interest because of its excellent oil shale land position, and because the federal government does not have an active oil shale leasing program. Oil shale leases upon trust lands have a primary term of 20 years and may be extended by commercial production or diligent operations. The lessee pays an annual rent of $1.00 per acre and a production royalty of 5%, gross value. SITLA Rule R850-20-3500 provides that the first 200,000 barrels of shale oil produced from trust lands shall be royalty free. To date, no one has claimed the royalty credit. SITLA advocates oil shale development and will work closely with its lessees and with other permitting agencies to facilitate the production of this important energy resource. John T. Blake is a Mineral Resource Specialist with the Utah School and Institutional Trust Lands Administration. He holds Masters Degrees in Geography and Business Administration. Mr. Blake has worked in the mineral leasing of state trust lands for over 24 years. In 1991, he managed a contract with the U.S. Geological Survey to analyze oil shale resources of trust lands using geo-statistical methods. The results of the study are contained in USGS Open-File Report 91-285.